If you didn’t know, Windows Azure allows you to create a free web site! It is very quick and simple to set up once you have your Azure account set up. After doing that go to the portal and choose to create a new Web Site. I recommend picking from the gallery and choosing WordPress. There is such a vast ecosystem around WordPress as a CMS system that it is simple to use and set up. NOTE: Of course you can use others, even a static web site using the TFS/Git deploy feature even. Do whatever you want. I just think WordPress is great and allows you to scale your site features without writing code, etc. This will walk you through a wizard to pick some names and options. It is pretty self explanatory. Once completed you will see your site provisioned in the portal. Just click that link and you will be taken to your site…which for WordPress will be the initial setup page to choose your login. After you pick it you’ll want to Activate it as the current theme. Now let’s do some simple configuration. 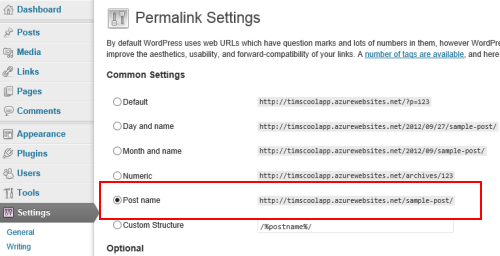 First (in the WordPress admin site) go to Settings->Permalinks. Choose the “Post name” option. This will prevent commenting on content. Next using the Responsive theme we can configure the home page. Go to the Appearance->Theme Options section. You’ll see a “Home Page” option for the Responsive theme. You can set the main text, tagline and two other options. 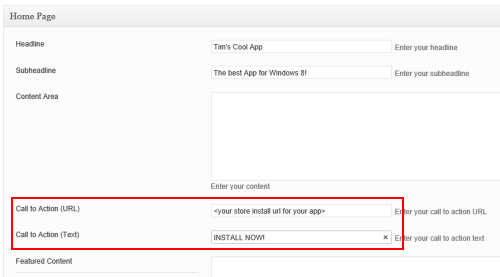 This gives you the chance to set the URL for your app that is provided from the Windows Store. Here are some posts to help you find URLs for your app: Linking your apps on the web and Connect your web site to your store app. You can also remove the theme logo to provide your own logo in the Appearance->Header section to provide your own image. You can also specify a custom image on the main “hero” section of the home page instead of the default image and specify that. Once all these quick tweaks are done, your home page is done. Visit the site to see the quick changes. Done! You can see this example at http://timscoolapp.azurewebsites.net. 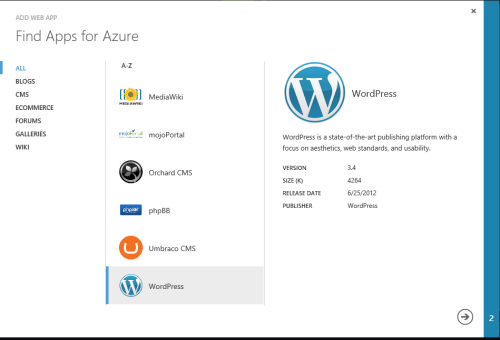 Now you have a free site on Azure to host marketing your app. Of course this helps those getting over the hump with providing a nice place for a simple privacy page, but also enables you to have a way to provide other pages for your app. You could provide more detail on features, have a form to collect feature requests, whatever. WordPress is very flexible and the same process you used to create the privacy page can be used for other full-page content. Or you can explore what WordPress has to offer you. 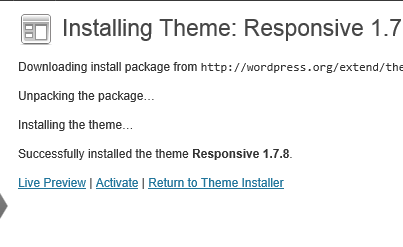 Again, there are many different ways you can do this and even within WordPress other themes you could choose. However I think the Responsive one is a simple one to get started with as a base. You may want to not have “azurewebsites.net” as your site URL as well. If you wanted you can migrate to a shared instance (not free) and have custom domain name resolution on your Azure site as well.